After last week's San Francisco-style Sourdough with 30% whole wheat, I considered a number of modifications of the formula. The leading candidates were 1) increasing the whole wheat to 50%; 2) adding some honey or other sweetener; 3) adding a mixed grain/seed soaker. In the background but not very far back was my wife's request that I make her some soft sandwich rolls that were low profile. When she gets a rather spherical roll, she cuts a horizontal section out of the middle. So, starting with the my San Francisco-style Sourdough formula, I attempted to accomplish all of the above in one swell foop. I increased the whole wheat to 50% of the total flour. That was the easy part. I had bought a mix of grains and seeds called “Harvest Blend” from KAF and decided to use that as a multi-grain soaker. I planned to add this at 18% of the total flour weight. I had no clue as to the appropriate amount of water to use for the soaker, so I used 125% of the weight of the Harvest Blend, which is what some similar multi-grain soaker's in Hamelman's Bread calls for. I added 4% honey, on a similar basis. This all seemed quite reasonable to me. I thought this new formula ought to make a pretty tasty loaf and also good sandwich rolls, if I could figure out how to make them as flat as my wife wanted. What's the saying? “Nothing ventured, nothing gained.” Or is it, “No guts, no glory?” Or maybe it's Pat's, “Sometimes you gets the bear, and sometimes the bear gets you.” Well, there were times when I thought I felt the hot breath of that bear on the back of my neck. After letting the levain ferment overnight and the soaker soak, they both looked very good in the morning. So I mixed the flours and water and let them autolyse for 30 minutes. I then added the salt and levain. I decided to hold back the soaker until the dough had pretty good gluten development. As I mixed, I thought the dough was on the dry side, so I added some water - maybe 30 cc's. After mixing for 6-7 minutes, I added the soaker. Yikes! There was 20 to 30 cc's of free water hiding underneath the soaked grains and seeds. When I turned the mixer back on, my dough was severely goopy. As I continued mixing, the dough was looking like 90+% hydration rather than the 78-80% hydration I had intended. So, my plans for the dough changed. Rather than fermenting for 2-3 hours with a couple stretch and folds, then shaping and retarding to bake the next day, which is what I had planned, I treated the dough more like a San Joaquin Sourdough. I did S&F's in the bowl every 30 minutes for 2 hours then retarded the dough. 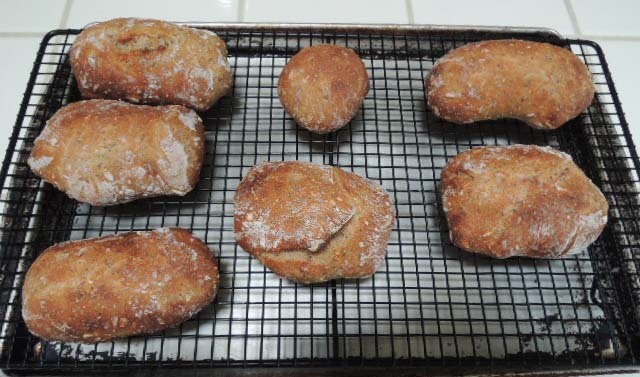 The next day, I preheated the oven and divided the dough into one 500 g piece, which I shaped into a boule and retarded to bake the following day. The rest I scaled to 4 oz and “shaped” as ciabatta rolls, which is to say, by simply folding the pieces like envelopes. I proofed the rolls for about 50 minutes, as the oven was heating. I then baked them at 480ºF with steam for 10 minutes and then for another 5 minutes at 455ºF/Convection bake in a dry oven. After a night in the refrigerator, the boule was warmed at room temperature for a couple hours while my wife roasted some beets and my baking stone pre-heated. I baked the boule at 460ºF with steam for 15 minutes then for another 15 minutes at 435ºF/convection in a dry oven. The loaf remained on the baking stone with the oven off and the door ajar for another 20 minutes before transferring to a cooling rack. 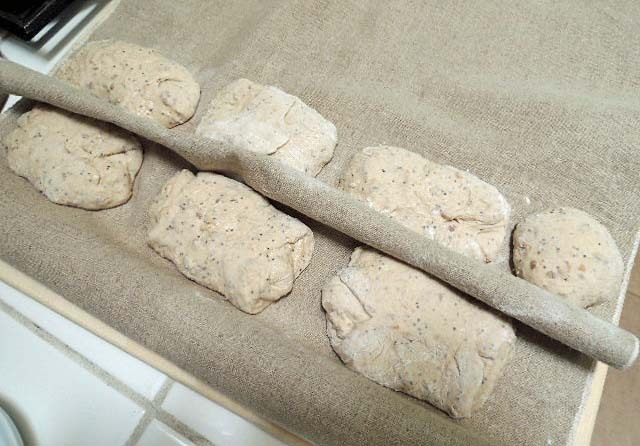 I let the loaf cool for several hours before slicing, thinking that this very wet dough need some “curing” time like a high-hydration, high-percentage rye bread does. For both the rolls and the boule, the crust was soft and chewy. The crumb was very moist and almost gummy, but not really. The aroma and flavor were very assertive. 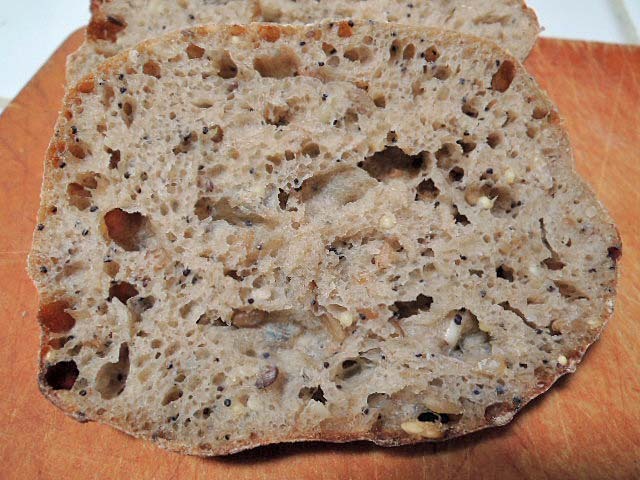 Whole wheat predominated with very apparent poppy seed and less apparent sunflower seed flavors. There was a definite honey flavor to me, but my wife did not find it too strong. We made toscano salami sandwiches with the rolls and had slices of the boule with sweet butter with a dinner of salmon cakes and a salad. I thought both the rolls and bread were pretty good and improved after the first day – definitely worth making again with some modifications. The thing is, my wife thought they were fabulous. She absolutely loved the flavor. The next steps will be to decrease the hydration and either eliminate the honey or substitute another sweetener. in a good way! You can't help but like this bread. I would never think of making rolls like that but will tomorrow with the dough autolysing right now!. Always thought rolls needed to be enriched for some strange reason - not so! I say Damn the torpedoes - full speed ahead. My apprentice is trying to lick the computer screen and howling in German or possibly Yiddish. You made her day David! That is the way multi grain bread is supposed to look. I know when I do soakers or add fruits, nuts or seeds the HL can be tricky. I always keep extra flour handy to adjust or water. Sometimes I soak and sometimes I add things dry so doughs vary a lot. Always fun to see what I get in the morning after a night in the refrig. Thanks for sharing and the photos. We really enjoyed this bread, but I'm going to continue fiddling with it before I'm satisfied. At that point, I'll share the formula and procedure. I'll be looking forward to your final formula. Looks awesome! great idea to change directions ! Bread baking is a lot like playing a musical instrument in that, if you have a sufficiently diverse repertoire of techniques, you can deal with unanticipated occurances by finding something in your bag of tricks that ought to work. Surprisingly high hydration dough is nothing compared to a broken violin string in the middle of the first movement of a concerto. This particular grain and seed blend could have been added with just a brief soak or none at all. It has flaked wheat and rye, oat groats and hulled millet. There are no whole or cracked wheat or rye berries. I think soakers can add a nice dimension to bread texture, and they delay staling. I have really enjoyed the breads I've made with soakers. Love the color from the half whole wheat. And a great recovery from that extra water in the soaker. It looks quite yummy. The random roll shapes are great, and they look pretty flat. Funny how the flat roll challenge was met willy-nilly, eh? Nice breads David; I have been using KA's Harvest Blend for years. The formulation on the package is quick and easy to make in an afternoon just as is if I am out of bread and don't have time for the normal 2-3 day ritual. Better than anything in the local stores, at least here. Cheers. The rolls are stunning, though I also like the boule quite a lot. I have a tendency of going overboard with hydration, but I doubt I can ever coax it to shape into such lovely rolls, instead of a huge troll that I make. Great looking rolls and boule, David! Very impressive boule crumb for such wholegrain content! your bread always gets a good even beautiful baked crust. 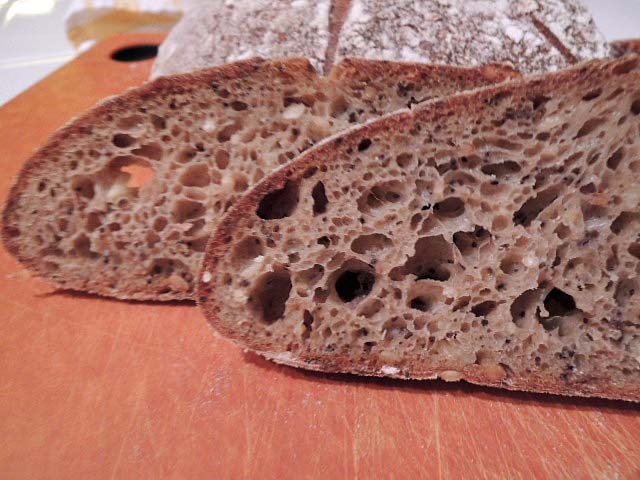 like the chewy open crumb..
Looks so good! I would like to try this when you post your final recipe. I am looking for more whole wheat sourdough recipes that produce great bread like this....not too heavy. Your boule is exquisite! The rolls look wonderful and ready to eat. I look forward to your further explorations. 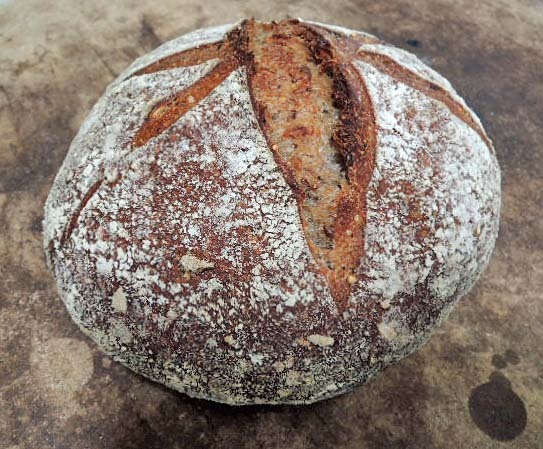 I did bake another version of this bread in August, with sprouted wheat flour, and I made it again last month. The formula still needs work. It all looks great and tasty, I would tear into that as soon as it came out the oven.